Solar Powered Security Light - Solar outdoor lighting for peace-of-mind. 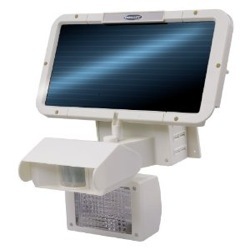 Solar Powered Security Light - Solar outdoor lighting for security and safety. We like the Concept SL-100 and consumers agree! The consumer's best-choice in solar motion lights. The Concept SL-100 32 LED Solar Security Light with Motion Detector lights an area of 190 feet for as long as 10 hours with 32 bright LEDs. Installation is a breeze; no wiring, minimal tools and 4 screws (8 screws if you mount the panel separately). Yes, the light can be installed as a unit or the 2w amorphous panel can be mounted separately from the light (12 foot wire included for remote panel installation). Panel in the sun, light under eave - or something like that. The built-in motion sensor has adjustments that allow you to determine how long the light stays on once it's been triggered and a photocell automatically turns the light on and off according to how much light it senses. Unlike most solar motion lights, this unit has a 4 volt lead acid battery that is replaceable, a clear sign that they're made to last long enough to actually require a battery change. Solar motion lights not only increase your security but the safety of your invited guests and yourself by lighting your property and reducing hazards. The Concept SL-100 32 LED Solar Security Light with Motion Detector is currently the highest ranked solar powered security light that Amazon carries. "...we are extremely pleased with it and plan to order more. We really are very happy with this purchase and recommend it." "Since going on our solar lighting kick, we have tried a several of solar security lights and this is the best of the lot." Why Install Solar Powered Security Lights? Solar outdoor lighting is functional during power outages. Easy to install, no wiring. Situate them anywhere as long as the panel has sun access. Lights mounted in out of the way places are tamper resistant. Intruders don't like lights that suddenly come on. Adequate lighting reduces accidents due to tripping and falling.